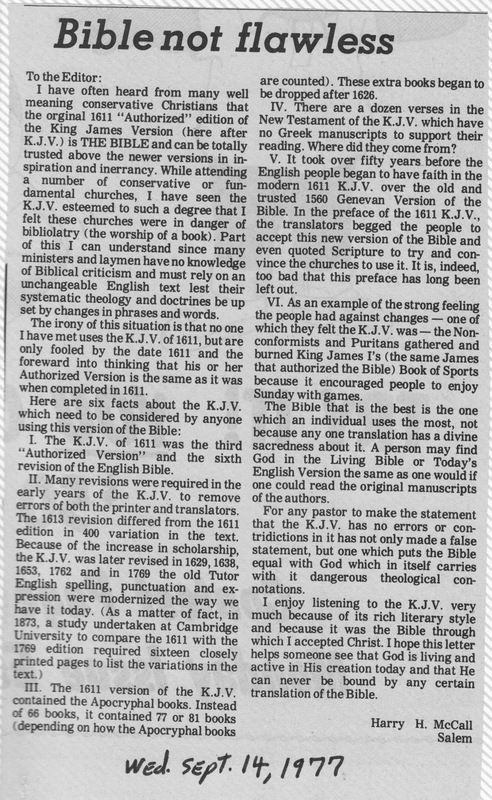 It has been over 35 years since I published my first article debunking the Bible. 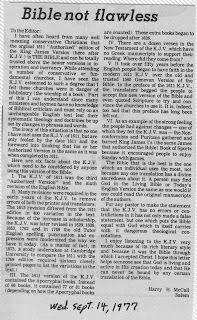 After leaving Bob Jones University in 1972 where we had to learn our King James Bible verses verbatim (Capitalizations and punctuations)for our Bible exam, plus giving up my license to preach by a small independent Baptist church (Stamp Creek Baptist Church in Salem, S.C. because I told the adult Sunday school class I taught that Jesus and the apostles did not use the 1611 King James Bible as the first century is not 1611 and Greek is not English . . . deacon’s meeting was called that night and I was asked to leave the church). When one understands that this area of the southeastern U.S. is the “Buckle on the Bible Belt” and is also an area where the King James Bible is on par with the Trinity (Father, Son, Holy Spirit and King James Bible); a place where one’s personal testimony involves being washed in the Blood of Jesus while championing the 1611 King James Bible Version over “Modern Perversions”, then one will have a context for my letter below and the sharp reply by Mr. Eddie Cox (who I noticed died last year). This Letter to the Editor appeared in the Seneca Journal on Wednesday September 14, 1977 and was quickly followed by Mr. Eddie Cox’s rebuttal five days later. I have scanned them in from my scrapbook and you can click on each to enlarge for reading. Well Mr. Cox . . . I never was "set straight"!